So I will do one for the next three months. At the end of this post I will ask again for your suggestions and one of those will become the theme for January. In November, we choose February's theme and so on. 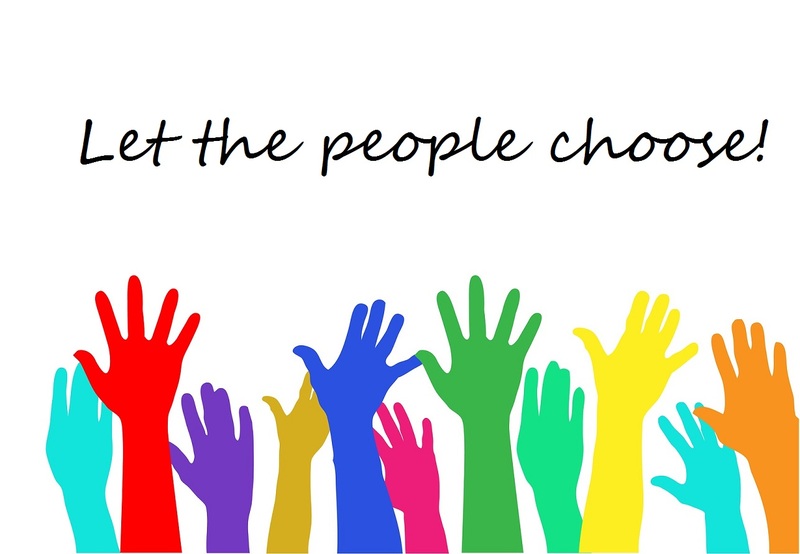 I will post the results in my sidebar so you have plenty of time to decide what to show. Obviously this post could be twenty pages long and I could still be typing but I will try to keep it to less than that! 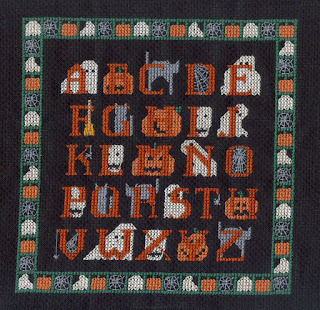 Hallowe'en is one of my favourites themes to stitch. I always have a spooky project (or three) in my WIPs and several more in my stash and on my wish list. 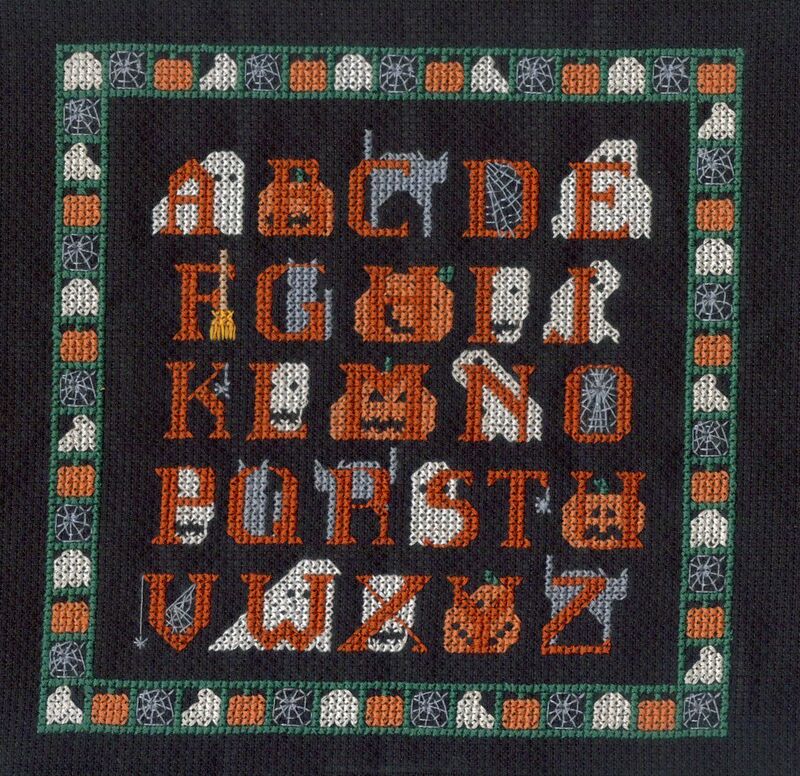 Back in 1996 I stitched this alphabet from a Better Homes and Gardens book. It is now framed and lives in my son's room. It's been fun seeing what the wheel chooses for me each day. I do hope to get a couple of finishes this month. I have the magazine but you can download it direct from Herrschners now. Hallowe'en at Hawk Run Hollow by Carriage House Samplings. I even have a piece of fabric for it but not the chart. This will be a BAP to be started only after I finish my Discworld Mappe. If you want even more Hallowe'en goodness then do visit the Hallowe'en Ornie SAL Blog and view the list of Spooky Freebies there. Now it's over to you! All you have to do is make a post on the theme of Hallowe'en, mention The People's Choice SAL (you can copy the picture I used at the top of this post and in my side bar) and my blog. Please link up using the URL of the actual blog post, not the home page of your blog. I look forward to seeing what you all post. oooh, just thought of another theme - houses/cottages. Wow! 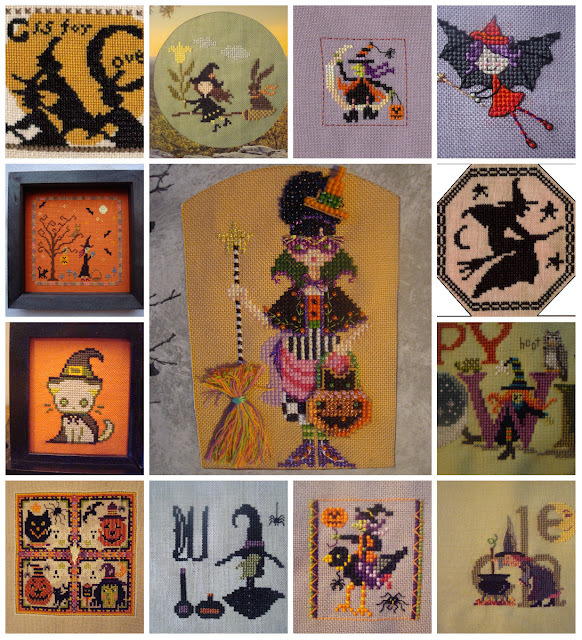 What a great collection of Halloween stitching! I especially like the treats box. Posted on my blog. You do have a lot of Halloween....I am thinking that February should be HEARTS. I have quite a few so I could do a long blog post! Spring. Bunnies. Butterflies. This was a fabulous post. It was full of eye candy for me , a Halloween lover!!! Hope İ will have enought time for to take part in your SAL! 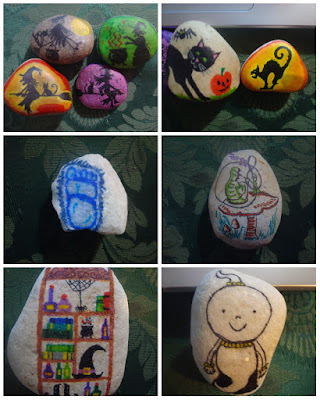 Great post Jo, you really have done A LOT of Hallowe'en stitching. I love the Halloween HRH. I look forward to watching your progress as you stitch it. What a wonderful collection of Halloween pieces Jo. Love them all. The box and Drac are stunning, I loved watching them grow waiting for the final finish. HRH would be stunning to watch grow, I enjoyed stitching my HRH one that now hangs in my brothers office. I have never seen that Dracula popup?!??? omg I love that! I must Google this! Your Halloween stitching is always so inspiring and I see something I've had in my saved patterns for a while now. I need to find the right fabric for it for sure! Whew that Hawk Run piece is huge! That'll be fun to watch grow, like Discworld. Looooove the little cat and pumpkin rock! Hey, rocks could be a theme? I can only think of only a very few patterns that contain rocks (pebbles, boulders, Cliffs of Dover, other synonymous things would be A-OK) so it would be interesting to see what people could come up with. 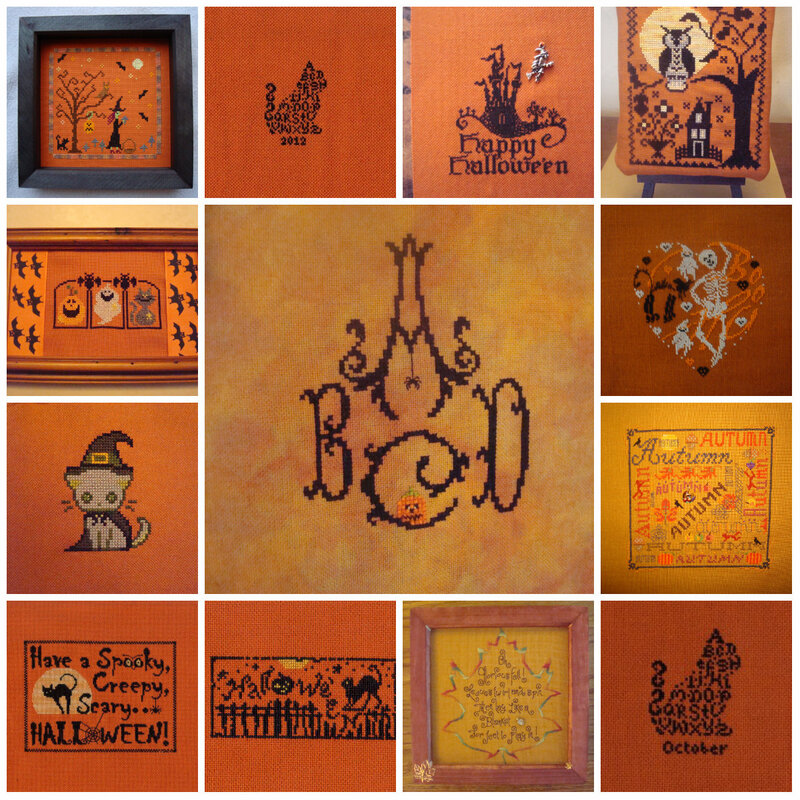 I love October, it's so fun to see all the halloween stitching on the internet! There are some beautiful pieces in your post, I will have to dig through mine and see if I have a little something I could find time to do before the end of the month and after my xmas baubles... I really need to get more organised next year and start my halloween stitching in January or something! So many wonderful pieces! Love the dracula one....that's amazing! Love all your Halloween projects. I seen the Halloween Hawk Run Hollow piece at the retreat and almost bought it. I like some of the blocks but not all of them. I pictured them as individual blocks on my display shelf. Like I need more projects haha. Thanks for hosting another fun thing to participate in. Some themes....leaves, snow, water, and colors like purple some random things that popped in my mind. I LOVE THEM ALL! Such fun, hopefully this will keep me busy and on track. I can see there's going to be lots of suggestions and plenty of things to choose from! This just a wonderful monthly project again. I love your ideas very much as there is always a lot of interesting things to see on the participants' blogs. As I don't have a blog any longer I can't show anything but only look and see. But I still remember the 26 months of the Alphabet Club which was so much fun. I love both your mosaics, the orange one and the darker one. You have stitched a lot of Halloween designs throughout your stitching career. I was keeping the Happy Halloween reveal for the Halloween secret word search at the end of the month but decided to show it simultaneously in one blog post with the GG if that's ok with you tomorrow. Also could you tell me what you mean by birthstones for next month or suggest a pattern?I have no idea.AriadnefromGreece. Wow, you really do love your Halloween stitching! The combination of orange and black is something I really enjoy myself. My own post will be online a little later...not too late, though, I am hoping for this weekend! I am still in love with your Draci pop up box. I have the magazine but I don't know if I'm brave enough to give it a go. So I'll just admire yours. Love love love your future Halloween BAP. My eyes just dart everywhere looking at that one. I've never seem the Trick or Treat Fairy (weird for me!?) and love it. You've got some amazingly wicked Halloween stitching Jo. LOVE IT ALLLLLLLL! Apparently I am unable to check into this 'not too late'...this really is becoming a running gag, isn't it?